Curtis Park was developed in the 1860s and 1870s as a fashionable residential suburb north of Downtown. Today, it remains one of the center city's most accessible center city neighborhoods for Downtown workers, characterized by its tree-lined streets, its broad range of housing types, and its social, economic and ethnic diversity. 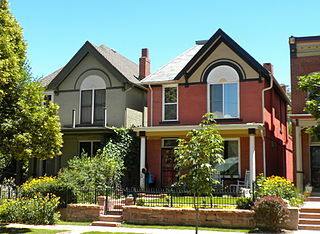 The housing mix is wide ranging: single story duplexes stand next door to recently renovated grand Victorian mansions; flat-roofed row-houses next to classic, two-story Denver Square brick houses; Queen Anne-style houses with second floor porches are also numerous. There are three designated historic districts in the Curtis Park neighborhood: Clements, San Rafael and Glenarm Place. Since its founding, Curtis Park has always been a mixed-income neighborhood. Interspersed among the neighborhood's turn of the century mansions are smaller houses built by waves of immigrants who came to Denver to join the workforce during the city's early years. Throughout the neighborhood's history, many of residents have worked in Downtown Denver, which is only a 15-minute walk or a quick ride on RTD's light rail - or, in past decades, on streetcars — from downtown's businesses and office buildings. This is also a remarkably diverse neighborhood. Approximately 30% of the residents are African-American, 30% are Latino, and 40% are white. A current effort that is changing the landscape of Curtis Park is the rebuilding of the neighborhood's housing projects through a $26 million federal HOPE VI grant. Four blocks of two-story apartment buildings that were built for public housing in the 1950s were demolished in 2000. The area is being rebuilt to accommodate market-rate apartments and condominiums alongside affordable and low income units, creating a more economically diverse community. Construction of the new housing is underway, remarkably transforming the neighborhood. City landmarks include the Denver Enterprise Center (3003 Arapahoe Street), an innovative small-business incubator that utilizes the labor force from the surrounding neighborhood; the Women's Bean Project (3201 Curtis Street), an entrepreneurial business and job skills program for low-income women that is housed in a renovated firehouse; and Sacred Heart (2760 Larimer Street), Denver's oldest Catholic parish whose church recently completed significant renovations. The neighborhood's namesake open space - Mestizo-Curtis Park - lies in the center of the neighborhood, and was created in 1868 as Denver's first public park.